So having finished Battle for Broken Plains and put it through an Alpha Read, I’m looking for Beta Readers. Right now, I’m looking for readers who can provide feedback on story structure, plot, style and pacing. If you’re interested, drop me an email at gunpowder.fantasy@gmail.com with your preferred format. When I had finished writing The Cerberus Rebellion, I thought that I had a pretty solid build on my hands. So I sent it off to my Beta-Readers and waited for it to come back. Ergodic Mage had contacted me through my contact form and offered to beta-read for me. His feedback was invaluable in cleaning up Cerberus before it went to Edits. One of his suggestions was that Chapter 2 really didn’t serve much of a purpose other than to introduce characters. So I cut it and folded the important information into subsequent chapters. I still like Chapter 2, but I agree that in context it didn’t do much. So I’ll post it here! Without further ado, Original Chapter 2 (a Hadrian POV)! The Temple was the central point of worship in any settlement in the nation of Ansgar, though the size of the structure varied broadly and generally reflected the wealth of its patrons. The Earl of Odwolfe was a wealthy man, and that fact was reflected in his offerings to the Temple: the Odwolfe Temple was not a modest structure. Nearly as large as a Baron’s Keep, the temple was built with obsidian stone brought from the coastal volcanoes hundreds of miles away, and timber from the great red pines in the north of Ansgar. Rich tapestries and golden ornaments, studded with gemstones and inlaid with silver, adorned the walls and the pillars. The Temple could hold nearly two hundred people comfortably; there were nearly three hundred people in it now. To either side of the main aisle, rows and rows of guests had been packed into the temple. Lesser lords sworn to the two noble houses that were to be joined, along with their families, were seated directly behind the immediate families of the betrothed. The lesser lords held castles and ruled cities in their noble’s stead. More than two dozen of the lesser nobility, and their families ranging from one to a dozen members, had been invited. Behind the lesser lords sat knights of various houses, nearly fifty of them all together; most of them had brought their wives, those who had them. The rest of the benches had been filled with merchants and other important members of the Western Ansgari community. Some of the lesser merchants stood against the walls of the temple. Lord Hadrian Clyve, Baron of North Griffin Cliffs, escorted his youngest sibling and only sister down the center aisle of the temple toward the rest of the party that stood before the priest. Hadrian was a massive man, like his father had been. A thumb more than seven feet tall, Hadrian had taken the body that he had inherited from his father and improved on it through constant training and physical work. Even at forty years old, Hadrian could lift more than any of his guardsmen. He wore his black hair like his father had: in a long ponytail that reached to the middle of his back. Gray had crept in at his temples and his hair had started to recede from his forehead. He had inherited brilliant blue eyes from his mother, like sparkling sapphires set under thin eyebrows. Hadrian wore the official clothes of his position: a satin white shirt with a red rampant griffin sown over his breast, black trousers, silk and well tailored. His full-length white cloak, lined around the neck and shoulders in light brown fur, was also emblazoned with a red rampant griffin. He wore the amulet that every Baron of North Griffin Cliffs had worn: a golden griffin nearly a foot tall clutching a massive ruby and several rings that came with his titles and accomplishments. His younger brother, Lord Raedan Clyve, Baron of Broken Plains, stood at the head of his family’s party. He was seven years younger than Hadrian, but he did not look his age. His shoulder length hair had once been merely black, now it was almost blue. His green eyes, inherited from his father, now glittered a brilliant emerald color, with the glow of one knowledgeable beyond his years. He was half a foot shorter than Hadrian, and not nearly as massive, but was still an imposing figure. He also wore clothes fitting of his position. His satin shirt was black, the three boulders on his chest were a brilliant white, his trousers were black satin as well, with a thick white stripe down the outside. His jet black cloak was lined with black fur and had clustered white boulders across it. He wore a more modest amulet around his neck and his griffin clutched an onyx stone that was nearly half the size of the ruby that his brother’s griffin clutched. An ornately carved staff, with a large ruby held in the top, rested in the crook of his arm. Hadrian had never understood why his brother carried staff with him at all times. The only time Hadrian had asked, Raedan had brushed the question off with whispers of magics and orders. Their youngest brother stood beside Raedan wearing a black wool suit with Raedan’s symbol on his breast. He was six years older than their sister and six years younger than Raedan. He had taken after their mother in many respects, including his blue eyes. He was shorter than Hadrian by a full foot, with had a more modest build and auburn hair that was cut short, a concession to his station as a member of Raedan’s Guard. He wore only the onyx-set silver ring of an heir; Raedan had not yet married nor fathered a son that could take on the mantle of Baron Broken Plains. On the opposite side of the aisle, Lord Alistair McKinley, third son of Lord Wallace McKinley, Earl Odwolfe, stood before the priest. He was a thumb more than six feet tall and well built, though he looked tiny compared to his soon-to-be brothers by marriage. Some generations back, the McKinleys had married four generations of Earls to women of Nordahr and Beldane; their golden blond hair and crystal-clear gray eyes were a family trait passed on from that heritage. Alistair kept his locks tied in a short ponytail behind his head. He wore a black satin tailcoat, the black wolf of his father’s crest across his breast was flanked by two large gold bags. His red satin trousers had a thick black stripe down the side. He served in his father’s guard, as a lieutenant, but was being groomed to serve as his father’s representative to the king in Aetheston. His eldest brother, Cedric, stood proudly beside his younger sibling. The heir to the Earldom took after his father, some might say too much. He was shorter than Hadrian by a full foot and could only be called stout by the most charitable person; most called him fat. He wore a black wool tailcoat with a red cloak attached at his shoulders by wolf’s head broaches, his father’s badge was sown over his heart and the symbol adorned the back of the cloak. Their father sat before them, in the first row of benches. He was of even larger girth than his heir and eldest son. He wore a satin shirt and a flowing cloak, attached at his shoulders by a pair of black iron wolves. The Earl’s thick fingers were adorned with rings that had been specially forged for him and his signet ring hung suspended around his neck on a thin silver chain. The party’s last member of note was Stephanie Clyve, the bride. She wore a perfectly cut white gown, sown from satins, silks and lace. A seated wolf broach adorned one breast, a seated griffin the other. She was the youngest of the Clyves, just past her twenty-first year, and though she had been betrothed to the Earl’s son for nearly seven years, she had only met him a handful of times. Her hand trembled slightly and tears welled up in the corners of her eyes. Hadrian squeezed his sister’s hand gently and nodded to her. And with that they started down the aisle toward the priest and their gathered families. The marriage would cement the bond between the two families that had shared a border for more than a thousand years. As part of the marriage arrangement, Hadrian had secured trade and loan agreements for himself and Raedan. Their merchants would get special consideration from the earl’s moneylenders and merchants. In exchange, Odwolfe had been granted one of Hadrian’s southern towns and the fertile farms that surrounded it. He had also agreed to provide the merchants of Odwolfe with special prices for minerals extracted from the mines of the Griffin Cliffs. Heads turned as the bride was escorted through the assembled crowd, her face covered with a lace veil. The musicians played a tune, The Lovely Maiden, if Hadrian was right. Many of the lesser nobles of the southern territories had tried to marry themselves, or their sons, to Hadrian’s youngest sister. But his father had told him that all marriages needed to be carefully considered before they were agreed to and needed to benefit both sides of the arrangement equally. The Earl Odwolfe’s son had been the most promising prospect for Stephanie. It would cement an already close relationship between the two houses and she was likely to be the wife of a lord at the king’s court. The Earl of Odwolfe was one the wealthiest nobles on this side of the West Valley and Hadrian was very soon to be a very powerful member of the Western Ansgari nobility: his wife’s father was elderly and would soon pass the South Griffin Cliffs to Hadrian. So the wedding had been agreed to, the preparations made and now Hadrian escorted his sister to her marriage ceremony. They stopped just short of the stone altar and waited for the music to die down. “Who gives this maiden to be wed?” The high priest asked. He was short and bald and even the flowing white and red robes of his order weren’t enough to hide the fact that he was nearly as heavy as his patron. “I do,” Hadrian announced. He smiled at his sister and then he placed her hand in her groom’s. He stepped away from the couple as they stepped up to the altar and then took his place between his sister and eldest brother. The celebration hall was much larger than the Temple, Hadrian would have estimated that the hall was nearly twice as large, but it had been filled with even more people than the smaller structure. The hall was separate from the rest of Odwolfe Castle; hundreds of years earlier it had once been Odwolfe Keep. Ancient engravings in the stone walls had long ago been worn smooth and the timbers supporting the roof had been recently replaced, likely in preparation for the wedding. The hall had been filled with long oaken tables and sturdy benches. Dozens of lanterns burned on the walls, their light reflected off of mirrored backs into the middle of the room. Against the back wall, on a raised dais, sat the bride and groom flanked on either side by their families. The Earl Odwolfe sat to the left of his son, his plain-faced wife to his left. Lady Elizabeth Odwolfe worn her most elegant silk gown, the deep blue highlighted by a white pearl necklace. Her brown hair was starting to gray and the wrinkles around her green eyes were prominent. To her left was her oldest son and his wife, Sarah, a much more beautiful woman than her mother-by-law. She wore a ruby gown and a simple gold chain hung from her neck. Her red hair was pulled up in an elegant bun, held up by gold and silver pins and broaches. She was great with Cedric’s third child. Hadrian sat to his sister’s right, even seated he towered over her. His wife, Lady Alicia, sat to his right. She wore a much simpler gown than their hosts, but it wasn’t her place to try to look better than either the bride or their gracious hosts. The emerald gown was flattering, if on the conservative side for her usual fare. Her auburn hair was nearly as long as her Lord Husband’s and was intricately woven into a long braid. She had inherited her father’s pale green eyes and his small stature: her husband made her look a dwarf and many wondered why they had been paired so many years earlier by their parents. Raedan was the last of the noble families seated on the dais, no wife to join him at his place of honor. The lesser lords and their families were spread out around the dais, the most important were placed closest to the table. Knights of all orders and ranks were spread out further away from the dais toward the outer edges of the hall. Hundreds of stewards, serving girls and cooks made their way between the tables serving meat, bread and mead to those gathered. The Earl Odwolfe had spared no expense for the marriage of his youngest son to one of his family’s closest allies: massive boars roasted on spits over open fires, fruit and vegetables had been gathered from the best farms in the Earldom and wines and beers had been brought up from the Earl’s personal cellar and were being served in his finest drinking horns. Toasts and speeches had been made by the two families and pledges of loyalty before gods and men had been exchanged. All of the formalities had been dispensed of and all that was left now was to eat and drink until there was no more to eat or drink. Hadrian had stepped down from the dais to talk to one of his lords, a man that served his father before him as the Lord of Wilshire, the second largest city in the barony. Malcolm Dowell had managed to fight the signs of aging that had claimed the vitality of so many of his peers, even at more than twice Hadrian’s age he had made the journey without trouble. He ate and drank more than his share and thought nothing of it. Hadrian made it a point to greet him at every opportunity, and to get to know his heir, Thomas. “My Lord, you must excuse me, I must have a word with my brother.” Hadrian bowed to his elder and his son and then turned toward the exit. Stephanie’s look of worry was quelled with a subtle shake of Hadrian’s head as he slipped past the dais to the door. He lifted his cloak off of a hook behind the dais and flung it over his shoulders. Hadrian nodded to the two guardsmen outside the door, huddled next to a brazier. One man wore a heavy white greatcoat, a rampant red griffin emblazoned on a badge over his heart. The other man’s greatcoat was red with a black wolf and two gold bags sewn into a badge. 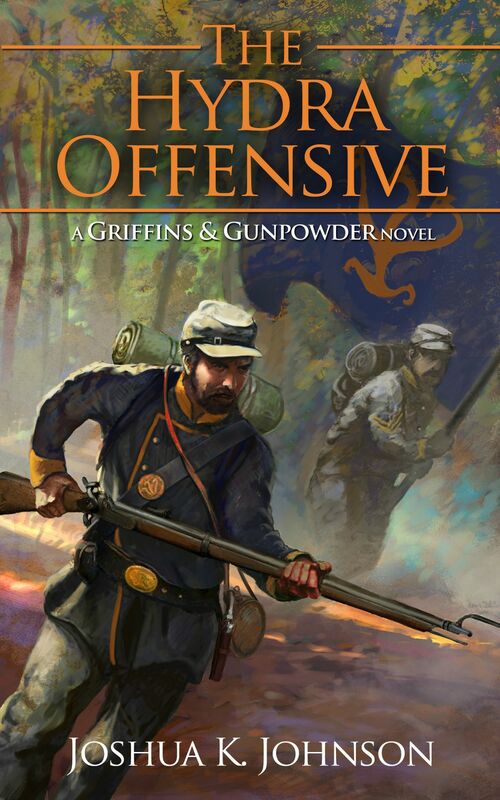 Their rifles hung on straps over their shoulders. A storm had passed through after the wedding ceremony and had blanketed the castle grounds in thick wet snow. A light wind still blew across the castle yard and Hadrian pulled his cloak in tighter to keep out the cold. “My brother passed this way,” he said to his guardsman, a veteran of his guard named Arian. His words frosted in the chill air as he spoke. “Carry on,” Hadrian nodded and started for the ramp. Like many fortifications in Ansgar, the Odwolfe Castle, and Odwolfe Keep before it, had been constructed on an artificial rise of dirt in open land. Foraging teams maintained a healthy distance between the castle walls and the nearest forests to provide a buffer against surprise attacks. The hall, as the former keep, had once been the main structure in the enclosed area of the castle. Now, it was just another out building tucked near the rear corner of the massive open area, enclosed on all sides by walls fifty feet high and ten feet wide. A hundred feet to the east, the new keep had been built in the center of the area, its high stone walls and massive wooden doors were less than three centuries old and still had a new look to them. Hadrian passed a massive mortar; the anti-siege weapon looked rather new, a surprising expense for the normally frugal Earl Odwolfe. “I thought you’d see me leave,” Raedan conceded when Hadrian reached the top of the ramp. The younger brother leaned against the parapets and looked out on the moonlit plains. Between the first two fingers on his right hand was one of the small cigars that he liked so much. They were rolled with a sweet leaf and then soaked in cherry juice. “It’s rather hard for either of us to sneak out of a room, even one so crowded.” Hadrian joined his brother and looked down from the walls. The wall stood fifty feet from the base and stood on a sharply sloped rise. Beyond the twenty foot slope, a dry moat had been dug and maintained, filled with sharpened spikes to prevent cavalry from riding through it. Further out, trench-works had been dug for soldiers to use in the defense of the castle. The fields beyond the trenches were ablaze with hundreds of campfires. Hadrian had brought his entire guard, a full two thousand soldiers plus stewards to serve them all. Raedan had brought two companies of own his guard, two hundred men and their attendant servants. “I just needed some air, brother.” Raedan stepped back from the wall and looked in on the castle grounds. More than a thousand guards stood watch on the walls and another five hundred encircled the keep and the celebration hall. One of the effects of the magic that flowed through Raedan’s body was that he would age at less than one fifth of the rate of those around him. He would live at least four hundred years, and closer to five hundred if Damon was correct. If Raedan were to marry, he would have to watch his wife grow old and die long before he did the same. He would likely outlive any children, and any of their children and grandchildren and great-grandchildren. “You must have an heir at some point. It would be unwise to give Franta another chance at reclaiming your barony when you finally pass. I know I won’t be around to see it happen, but those Clan-Lords pass their grudges well.” Hadrian knew that they had been over this ground more times than either of them could remember, but still they had these conversations. The screech that cut through the night air was unmistakable, even for the Earl’s guardsmen who had never heard the cry of a griffin before; it was the cry of a predator, and a large one at that. Raedan looked to the skies. No one else would be able to see the great beast, but he didn’t need to see it to know where it was. The hounds in their kennel across the yard barked furiously as the creature neared the castle. “Kiis,” Raedan whispered and Hadrian looked to the sky as the beast swept into view. The Earl’s guards had been warned that an appearance by one of Raedan’s companions was possible, but experience would still be jarring to anyone not familiar with the beasts. The griffin was the smallest of the three that their father had captured twenty years ago, but she was fast, and clever. She often flew out ahead of Raedan to scout and she was also able to show Raedan what she had seen. As she swooped toward the courtyard, Raedan and Hadrian started down the ramp to meet her. The Earl’s guardsmen were hesitant as the griffin landed, but Hadrian’s guards were accustomed to the grand beast. With a final beat of her wings, the griffin blew a billow of snow into the air. Raedan ran his hand along the griffin’s neck, the ruffled feathers soft beneath his palm. She had the golden hind quarters of a lion and the fore of a golden great-eagle with a white head and sharp blue eyes. Even as the smallest griffin of the three, Kiis was a massive creature. At her shoulders she stood five feet tall and nearly six feet long; her wings spread nearly ten feet across and she had talons larger than even the oldest of great-eagles. Raedan whispered to the beast in the Elf tongue, a language Hadrian had never learned. The beast shook its shoulders and tucked its wings close to its body. “She has something she wants me to see,” Raedan whispered to his brother. Even among the guardsmen that protected Hadrian, the full range of Raedan’s abilities were carefully guarded. He pressed his hand to the griffin’s heart and closed his eyes. Hadrian had seen his brother do this before and wondered what it must be like to suddenly gain the memories of another creature. To see things as they had seen it. He knew that the time it took for Raedan to gather those memories varied greatly. He had seen his brother stand beside one of the griffins for nearly six hours at a time, gathering days of vision and memories. Other times, it took mere moments. Fortunately, Kiis’ ability to collect her memories and visions to pass on to Raedan was better than either of her siblings. Raedan stood for only a few minutes beside his griffin as he gathered the visions that Kiis thought that he should see. “Messengers from the capital. A King’s train departed from Aetheston.” Raedan slumped against the griffin for a moment; the interaction with the minds of his griffins took a toll on his body. “A gold man with a spear, on a white and green banner.” The symbol of Eadric Garrard, Duke Elsdon and King of Ansgar. “We should rejoin the celebration,” Hadrian said after a moment. Earl Odwolfe had retired to his chambers early in the night, but Raedan and Hadrian still had to wait for him at the table in the great hall to break their fast the next morning. Both had risen with the sun, Hadrian had sent his men to pass the word that there was to be a meeting, with the Earl’s permission, after midday. Raedan had seen to it that his griffin had been cared for and then sent her back to his keep. The great hall was nearly as large as the celebration hall. Heavy iron chandeliers, their candles unlit, hung from timber beams and light streamed in through colored glass windows in the top half of the walls and reflected off of polished silver mirrors that had been hung on gray stone columns. Hadrian and Raedan were seated at a long table on a raised stone dais. A few other tables were spread throughout the hall, but most had been moved to the celebration hall for the wedding. Hadrian was dressed in black wool trousers and a white wool shirt, his fur-lined cloak thrown over his shoulders. The cold from the storm had not gone with the clouds that had born the snow. His brother sat beside him, dressed in a thick, black wool shirt and brown wool trousers. He had laid his cloak over the back of his chair. Raedan had a better tolerance for the cold than his brother. The brothers sat in silence, each with a steel cup of coffee before them. They had finished a full pot of the sweet black drink and had the second before them. “My steward told me nothing of a message.” Lord Wallace leaned forward in his great chair. Stewards entered, carrying a pot of coffee and cups to drink from, plates of bread and trays of butter. “Well, I suppose His Grace the King has something that he wants us to hear,” Wallace said and then let out a loud, booming laugh. “Father, what has you laughing so loudly, so early this morning?” His son entered the great chamber, sleep still heavy on his eyes. He wore red wool trousers, thick and warm, a white wool shirt and had a fur-lined cloak wrapped around his shoulders. Raedan hid a small laugh with a cough; it was nearly four hours past dawn, more late in the morning than early. “How long ago did they leave?” Cedric asked as he broke off a chunk of bread and poured a cup of coffee. “They left Aetheston six days ago. They should reach my doors fifteen days,” Raedan announced. Stewards brought plates of bacon and meat into the hall and set them before the nobles. “There are few matters that would trouble the King so much that he would send messengers to our far keeps,” Cedric noted. “War.” Hadrian suggested. He dangled his pocket watch on its gold chain and watched it twist as if of its own accord. His father had given him the silver plated watch when he had celebrated his eighteenth year. A rampant griffin was etched into the outside cover and the hands were made of ebony. Hadrian made it a point to carry it with him everywhere as a reminder of his father’s wisdom and advice. While Beldane was more stable than the nearby nation of Franta, it still had its shares of internal conflicts and was ever on the verge of going to war with either Steimor or Nordahr. Of late, certain factions of the nobility had refused to pay the taxes that they owed to the Grand Duke and the situation had escalated to the verge of a civil war before the offending nobility had surrendered and returned to the fold. Hadrian and Raedan remained silent as they ate while the Earl and his son discussed their choice of lesser lords and knights to accompany them to the capital, nearly ten thousand miles away. Hadrian had a feeling, deep in his gut, that the messengers brought word of war, and a summons for the levies of the Lords of Ansgar. After 8 months, 2 days, 93k words (not including excised chapters and snippets), The Cerberus Rebellion is ready to go into Alpha-stage 1, a full read in Scrivener. 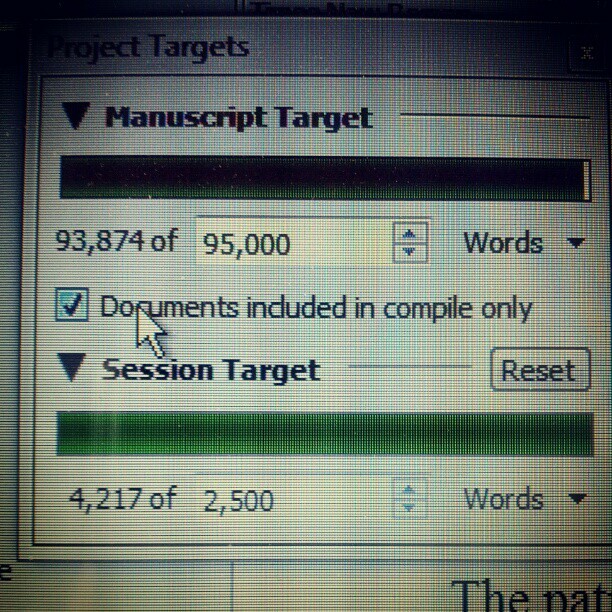 I have 5 weeks to get it through 3 Alpha-Reads and 1 Round of Beta along with all of the revisions to go with them. I’m shooting for a July release at this point so I can get some momentum going into the promotions I have planned for September 14! I’m still looking for a couple of beta readers. I’m just looking for plot, pacing and structure feedback. I’ve got an editor lined up for the more detailed stuff. The last week has been a flurry of activity as I near the completion of The Cerberus Rebellion and prepare to move it into the Alpha/Beta Read stage. In preparation for that, and knowing how busy a lot of the editors and cover artists are, I contacted a couple of editors and cover artists. I decided to go with heavycatweb.net for my cover. They sent over the initial sketches for the cover and I have to say that it is very impressive and I am looking forward to the finished product. They offered to add the title and artist name to it for an additional fee but why do that when my lovely wife is prefectly capable? After getting some quotes, I decided to schedule Nick at everything-indie.comfor the beginning of June. That gives me approximately six weeks to finish the last 5 chapters of The Cerberus Rebellion, get it through 2 or 3 rounds of reading by myself and then a round with beta readers. Speaking of beta-readers, my uncle agreed to beta-read for me and I’m very excited about that because he’s a great writer and will definitely give me great feedback. Finally I secured a map artist (Jared @ The Red Epic) to create a map for both the world of Zaria and a more detailed map of Ansgar. If you’re reading this post then you’ll have realized that I’ve moved to a new site. Gunpowderfantasy.com is official and the home of my new blog. On top of that, today I started a wiki that I’m going to spend some time filling in to provide background information and to keep all of the character bios straight for readers. Right now, I’m working on getting The Cerberus Rebellion finished. I’m going to spend as much time this weekend working on the last five chapters. I’m going to go through 1 read-through with Scrivener (the software I use to write) so that I can make on the fly changes. Second read will be on paper and I think the third will be using a text-to-speech program. I’m also working on securely long-term arrangements with my editor and artist to try and reduce the cost of production. 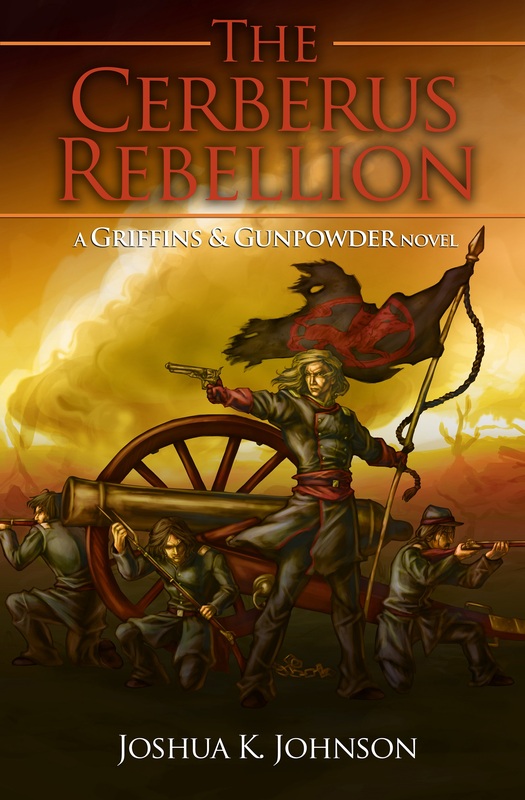 If all goes well, I should be releasing The Cerberus Rebellion at the beginning of July, which gives me some time to get a head of steam before my planned promotions on 9/14!